Sometimes it’s the simplest things that keep my kids entertained for stretches long enough for me to prep a meal. Tor is fascinated by everything in our tool-box and would like nothing better than to “fix” everything in and around our house — regardless of its actual need for fixing. 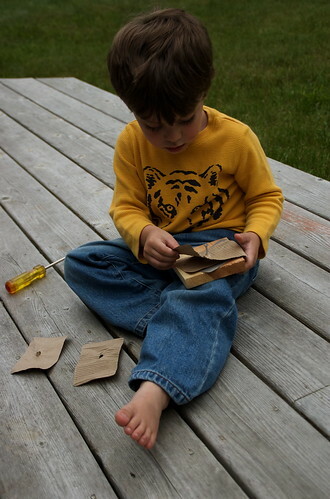 Recently I gave him a piece of scrap wood, a screw, screw-driver, and some sheets of well worn sandpaper and cardboard. He worked so hard on his “counting project,” his little tongue sticking out in deep concentration, and was so proud to show me how you count the pieces of paper as you put them on, then take them off and start all over again. It would appear that the handyman gene skipped a generation in our family — I’m looking forward to when we can have him tackle all the things that need tweaking ’round here! Hi! I love your crafts section of this site! I’m an artist myself and always looking for some good ideas for the kids. Keep the great suggestions coming! Thought you might like this one- http://www.uncleenvelope.com. Every month Uncle Envelope travels the world and meets with a different artist. Then he sends all his nieces and nephews paper crafts from that artist! My kids love getting something in the mail and the crafts are always adorable. I’ll keep checking in!!! Keep up the posts!